A traditional South American dish of diced red mullet marinated in lime juice and then mixed with avocado, red pepper and coriander. Red mullet fillets cooked with thyme and served with wok-fried Provencal vegetables. Crisp fillet of red mullet with cavolo nero, polenta and a lemon and lime dressing. Crispy fillet of red mullet served with a beetroot meringue, anchovy butter, cucumber jelly and curried hollandaise sauce. Crispy red mullet fillets served with classic sauce vierge, creamy polenta and a simple rocket salad. Red mullet with a shellfish veloute and samphire. Red mullet fillets served on a bed of samphire, finished with a creamy shellfish sauce. 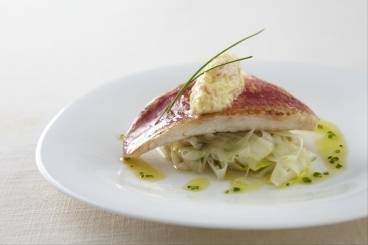 A crisp fillet of red mullet served with a refreshing fennel salad, chive dressing and fresh crab. Grilled red mullet fillets served with courgettes, peppers and aubergines.